The Federal Communications Commission proposed new rules for the high-frequency spectrum that will be the foundation for next-generation 5G mobile services. At an Oct. 22 meeting, FCC Chairman Tom Wheeler said that by proposing the new rules, the commission is "taking a serious leap that creates a competitive opportunity for this nation to be a leader in the forthcoming 5G world." In a press release, officials said previous assumptions that physical and technological limitations could not support mobile service in the high-frequency bands might have been wrong. New technology could allow use of the high frequencies for mobile applications such as 5G service, "with significantly more capacity and faster speeds for next-generation mobile service." The commission said its formal notice of proposed rulemaking builds on years of successful spectrum policy and seeks to create new, flexible service rules in the 28 GHz, 37 GHz, 39 GHz and 64-71 GHz bands. The FCC proposed making the spectrum available through a variety of authorization schemes, including traditional wide-area licensing, unlicensed access and a shared approach that accommodates local- and wide-area networks. The governments of China and the United Kingdom have agreed not to engage in cyber-enabled theft of intellectual property in a statement whose language mirrors that of a recent U.S./China accord. During a visit to Britain by Chinese President Xi Jinping, the two sides released a joint statement saying they agreed "not to conduct or support cyber-enabled theft of intellectual property, trade secrets or confidential business information with the intent of providing competitive advantage." A bipartisan bill announced Oct. 22 could significantly increase private investment in the next generation of Internet networks and possibly lead to faster broadband speeds and lower consumer prices, supporters say. The Broadband Conduit Deployment Act of 2015 would increase the private and public sectors' commitment to a concept commonly known as "dig once" -- the idea that when a city digs up a street for maintenance work or construction, it should also install pipe that can carry high-speed fiber-optic cables or other broadband conduits. That approach would avoid the need to dig up the street again when officials decide to lay down new Internet infrastructure. The bill is not the first attempt by lawmakers to institute such a policy. In 2012, the White House issued an executive order -- to no avail. The current bill, however, requires that new pipe be installed if the construction project receives federal funding and if survey results indicate a substantial demand for broadband within the surrounding area in the next 15 years. A security expert has found that most presidential candidates are using WordPress sites that could be vulnerable to hackers. Computer security expert Jonathan Lampe scanned candidates' WordPress-based sites and harvested 127 usernames from 13 of the sites. Only two refused his request. Lampe, who detailed his findings for the InfoSec Institute, gave Ted Cruz, Jeb Bush and Bernie Sanders Cs for exposing usernames on their sites. Marco Rubio earned a C-minus because his site also exposed folders. WordPress allows users to leave old, unused material in web-accessible folders even if they remove links to the content. Donald Trump's campaign website was one of the most secure and earned a B-plus. Lampe said it would have gotten an A, but he couldn't confirm whether the site was running a secure version of a donation plug-in. Most campaign sites are expected to use HTTPS. However, Lindsey Graham, Jim Gilmore and Lincoln Chafee (who dropped out of the race on Oct. 23) allowed unencrypted communications to and from their sites, according to Lampe's research. The highest grade went to Jim Webb, who earned an A-minus. His site used a security plug-in called Wordfence, which is designed to deter hackers. Webb dropped out of the race earlier this week. 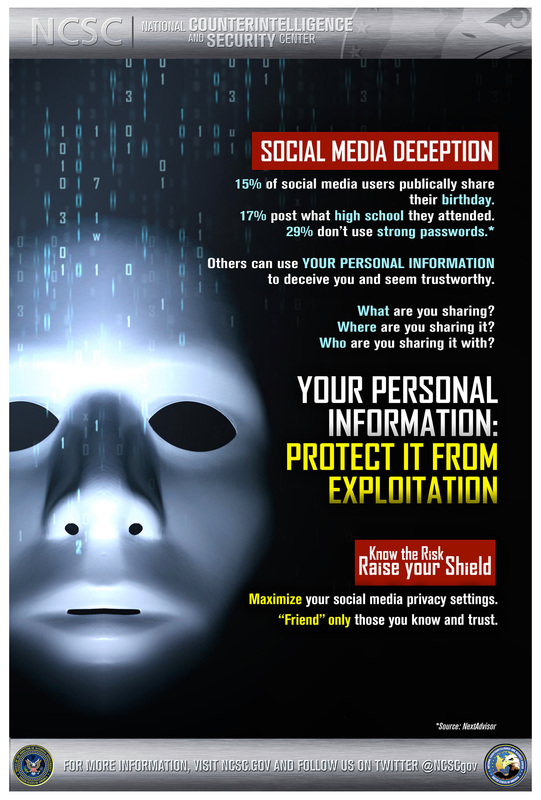 "Your Personal Information: Protect it from Exploitation" warns a new poster released by the Office of the Director of National Intelligence. The poster, along with two YouTube videos, is part of ODNI's effort to encourage employees inside the intelligence community and contract workers with security clearances to protect themselves from foreign spies on social media sites. The internal Internet safety campaign follows the nationwide fallout over the Office of Personnel Management hack earlier this year. U.S. officials fear that the 22 million stolen records could prove useful for foreign spies trying to obtain information from American intelligence staffers. China is suspected as the source of the breach. This is the second round of efforts to strengthen security precautions among the intelligence community. Previous videos centered on spear-phishing attacks. According to the current video, the next one will focus on human targeting and warnings for travelers.